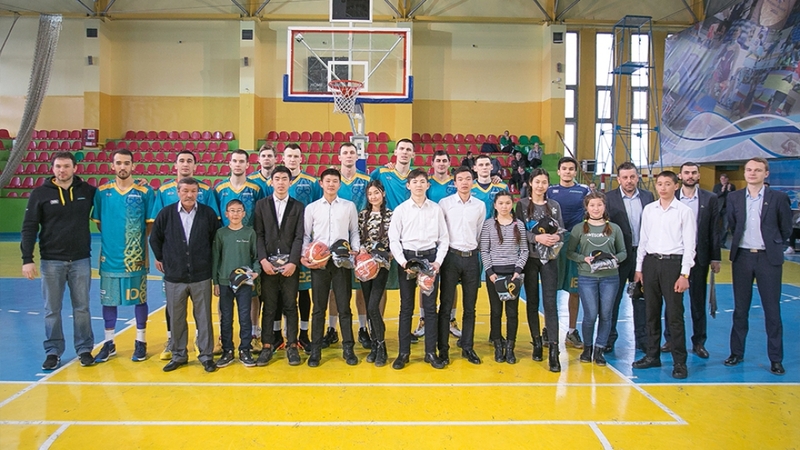 The capital basketball club Astana in addition to its participation in the Kazakhstan Basketball Cup arrived in the southern capital with a good deed. «Just in February boys from the village of Saryozek, Almaty region, wrote to us in social networks about that they are fans of our team, and that they play basketball themselves and want to look like our Kazakhstan players. The guys asked to help them with the balls, since there is no finance to buy the necessary sport equipment for basketball. They have girls and boys there, who play basketball. Our club responded to this request with pleasure. Our club together with Social Projects Development Fund «Samruk-Kazyna Trust» decided to present professional balls, as well as the game uniform and souvenirs of PBC «Astana», said Valery Tikhonenko, PBC Astana General Manager and the Olympic champion. After the game, «Astana» players invited all the guys to the court, where they gave the presents to young fans, and memorable photos were taken. After the official presentation ceremony, the players of the club in a free atmosphere talked with the guys and signed autographs. «We are pleased that every year the popularity of basketball has been growing. It's nice that these boys, the younger generation, watch our games from the remote places like this, and they know everyone by name and support us. Of course, I want to help as many people as I can. I think that each time we will hold as many such campaigns as possible, « said the team captain Rustam Ergali.